Phenolic Black Core bathroom partitions is durable and strong enough for even the most high traffic areas. 2 styles of phenolic are available- Color thru phenolic and black core phenolic. Phenolic restroom partitions are manufactured by adhering decorative laminate to a resin – impregnated kraft paper core. The surface and core sheets are then fused a high temperature and extreme pressure, giving phenolic partitions superior strength. Available in a wide range of colors, providing limitless design flexibility. Resists water, oil and bacteria, even usable in shower stalls. Phenolic partitions are the perfect solution for high humidity and water areas. 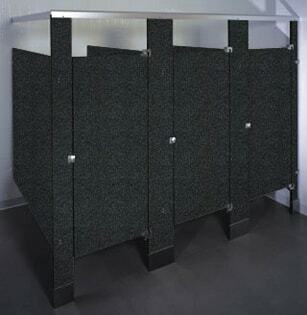 Phenolic Black Core bathroom stalls is a unique material designed especially for full water contact. It is ideal for high humidity areas, or where hose-down cleaning methods are used. The superior strength of phenolic offers many advantages, including overall damage resistance. Phenolic exceeds the Fire Protection Association’s recommendation for smoke production. The finish is available in many designer colors to appeal to any decorating taste. Hardware features emergency outside access to stall. 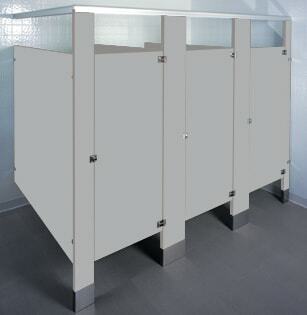 Solid Phenolic bathroom partitions doors and pilasters are 3/4″ thick, panels are 1/2″ thick, and come with a class-B fire rating. All edges are polished and beveled. Wall and pilaster brackets are type 304 stainless steel. Requires 1 ear or 2 ear brackets. All hardware and fittings are stainless steel. 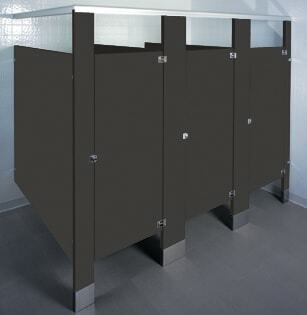 Phenolic Black Core bathroom stalls are manufactured for incredible durability. This material is impact resistant, will not chip, dent or delaminate and, is impervious to moisture. It is unaffected by steam or high humidity and resists marring with pens, pencils and markers. Standard material has a solid class “B” flame spread rating and will never carry a flame, melt or warp like other types of solid plastic. 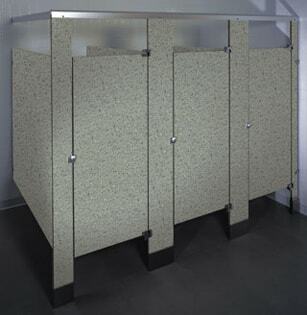 Ideal for shower and locker rooms or areas of high traffic and vandalism. Finishes can be chosen from a wide range of colors.